Receive an incredible 80% discount on new web hosting orders. Use coupon code FRIFLASH1 during checkout. Flash Sale: Friday, November 27th 12:00AM CST thru 1:00AM CST. 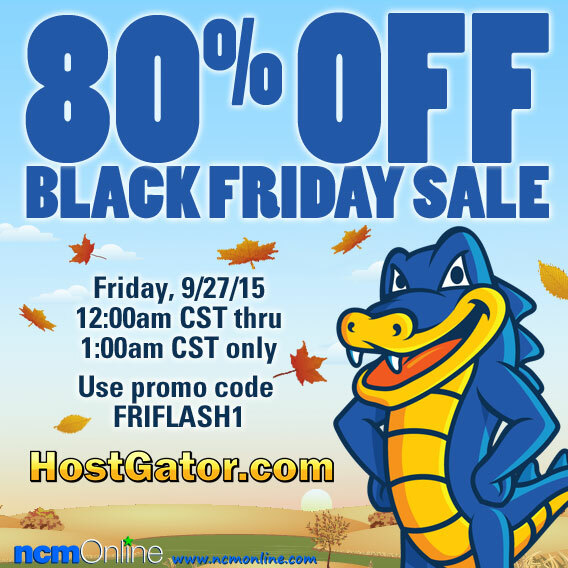 Take advantage of this HostGator 80% Off Black Friday Coupon Code, but the sale lasts only for 1 Hour starting at 12 AM CST on November 27th. This Flash Sale won’t last long, so head to HostGator.com now to save 80%! Discounted pricing valid for initial term only; all plans renew at regular rate. Offer ends 11/27/2015 at 1 AM CST.